Though I advocate and try to use the built-in iOS dictation feature Stop Typing: Better Learn To Dictate Text with Dragon Dictate for Mobile Devices [iOS] Stop Typing: Better Learn To Dictate Text with Dragon Dictate for Mobile Devices [iOS] Nuance's iPhone apps, Dragon and Dragon Search have been available for free download for over a year now. Since then, the company has added a few other similar voice to text apps to its line... Read More for the iPhone and iPad, there are occasions when good old touch typing must suffice. If, like me, you are not a fast or very efficient typist the built-in iOS keyboard can be a little daunting for many users. In a previous article, I shared tips for typing faster on the iPad 7 Good Tips To Faster Typing On The iPad 7 Good Tips To Faster Typing On The iPad Read More , but since then several specialty apps have been released that might help you increase overall typing speed on your iOS device. 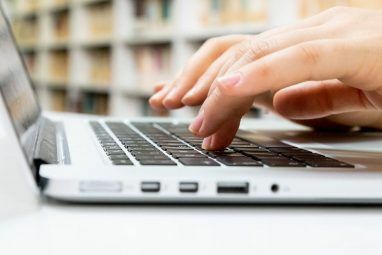 If you find yourself fumbling with the built-in keyboard, download a few of these free apps and practice typing risk-free. Also don’t overlook the built-in keyboard shortcuts feature, a part of the last two versions of iOS, which I explained in this article 10 iOS 5 Tips For iPhone, iPad & iPod Touch Users 10 iOS 5 Tips For iPhone, iPad & iPod Touch Users So many new features get added to iOS updates that we often don't take advantage of them all. The most recent iOS 5.0 and 5.1 updates for iPhone, iPad, or iPod touch users make the... Read More . If you want to get serious about improving typing ability on your iOS device you probably want to start by finding out your current typing speed. TapTyping does just that. It consists of a series of speed tests that track your typing speed, providing you with immediate results. If you are a beginner user of the iPhone or iPad, this app can help you get up to speed with the arrangement of the keys on the keyboard. The goal for improving your speed is to avoid looking at the keyboard as you type, but this is a little more difficult for touchscreen devices due to the lack of tactile feedback you get with a traditional keyboard. Nevertheless, it’s a useful app when you have a little downtime and want to practice improving your speed. 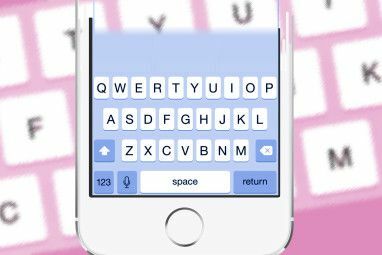 There is also a paid version of TapTyping which consists of a series of training courses to help familiarise you with using the built-in keyboard, including the primary keys (a – z), capitalization, punctuation and number keys, advanced tapping patterns, and complicated sentences and symbols. One of the unique and fun keyboard apps I like to use on occasion is Path Input, which I recommend for intermediate and advanced users of the iPhone. With this app you use your index finger to draw a path across the keyboard to each key or letters that you want to type, just like Swype for Android Swype For Android, Reviewed: A Hassle To Install, But Is It Worth It? Swype For Android, Reviewed: A Hassle To Install, But Is It Worth It? I've long since fell in love with sliding/swiping keyboard, as my SlideIT review from a year ago shows. 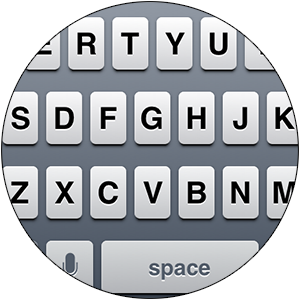 But when people hear "swiping keyboard," SlideIT isn't usually the first name that comes to mind: Swype... Read More . For instance, if you want to type the word “book”, you slide your finger to the B key, move to the O key, then to K, and lift up your finger. The app will figure out that you’re trying to type the word “book” and type it for you, despite the fact that you left out the second O. The app works great for single syllable words, but it gets a little more complicated for longer three syllable words. As you draw letters and lift your finger, Path Input will also provide alternative words which appear above the keyboard that you might be trying to type. From here you can tap on the correct word without having to further swipe the keyboard. Even if you don’t end up using Path Input for most of your typing, this app is interesting to use just for the technology. Note that this special keyboard cannot be used in other apps, instead you have to do your typing within Path Input then copy text to another app. The app also includes a special one-tap copy function that copies all of the text without you having to select it first. There is also a feature for exporting text directly to Mail, Messages, Twitter, the built-in iOS clipboard, or to a printer. You can download a free lite version of Path Input [No Longer Available], and give it a try before purchasing the Pro version. There are dozens of text editing apps for the iPhone and iPad, but if you do a lot of typing on your mobile device, you might want to check out FastKeyboard [No Longer Available]. The traditional method of typing is still used in FastKeyboard, but what makes it a little faster for some users is its sidebar of text editing functions and extra visible keys. The app has special icons for quickly copying and pasting text, undoing and redoing previous input and enlarging the font size and style of the text. It also puts the number and punctuation keys above the keyboard for easier and quicker access, with several rows of other special keys that you can scroll down and tap on. FastKeyboard is free, but can be upgraded to the ad-free version. Typing on an iOS device is never going to feel the same as typing on a traditional keyboard, but you can also try using the split keyboard feature on the iPad which enables to you to type while holding the iPad with two hands. Another useful way to quickly type text is to use TextExpander for iOS and Mac OS X [No Longer Available] which will type your commonly used words, names, and phrases based on your assigned abbreviations. 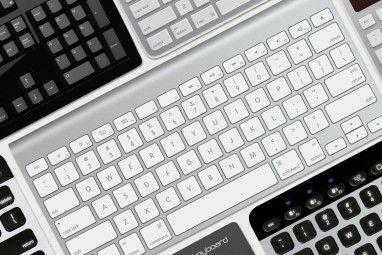 Apple will probably never make a tactile keyboard for its iOS devices, so let us know how well you’re doing with the built-in keyboard. Do you prefer touch typing over dictation? Which apps do you use to type faster and more efficiently? I have tried almost all of the above. and what iv found out is that they are quite boring. typing fingers, on the other hand is just awesome: awesome graphics, awesome music, awesome voice over and provides an awesome learning opportunity coupled with fun.